A new season of competitive Fortnite has arrived, and with it is a ton of information and news to stay on top of. From the best places to watch current placements, here’s everything you need to know about the Fortnite Fall Skirmish. The Fortnite Fall Skirmish is a six-week series where over 500 competitors are divided into five clubs (Bush Bandits, Dusty Dogs, Fort Knights, Rift Raiders, and Lucky Llamas) to face against each other in a variety of weekly events. After completing each weekly event, skilled players are awarded cash prizes and their coinciding clubs are awarded points. 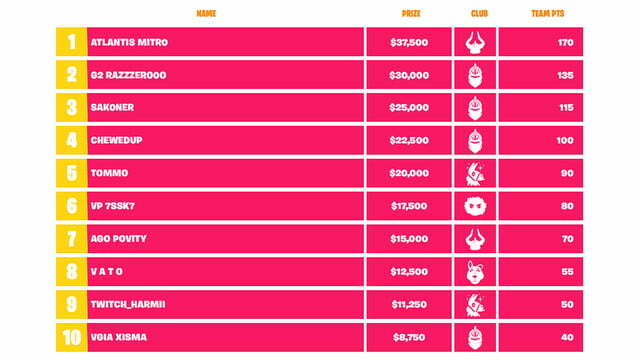 Depending on the total points clubs earn, $4,000,000 in prizes can be won with a total of $10,000,000 on the line including individual and team earnings. The skirmish begins on September 21, overlapping the start of Fortnite season 6, and finishes at Twitchcon on October 26-28. Epic Games will be streaming through their official channels on YouTube and Twitch with hosts KittyPlays and Zeke Mateus (ZekimusPrime). Players participating in the event can also be found broadcasting it live, including the likes of Ninja whose channel reportedly had more viewers during week one than that of Epic Games. The latest Twitch stream from the skirmish can be watched above. The week one format includes two Fortnite games — a skirmish called Hold The Throne Duos and a trial called Squad Goals. The goal of Hold The Throne Duos is to be the two-person team with the most points following six matches. The final ranking is decided by match placements and the total amount of eliminations a team earns during all six matches. The top 10 teams will be awarded from a prize pool of $250,000. The team with the most points following all matches will earn the Hold The Throne award with +2 points added to their score and an additional $50,000 in prize money. 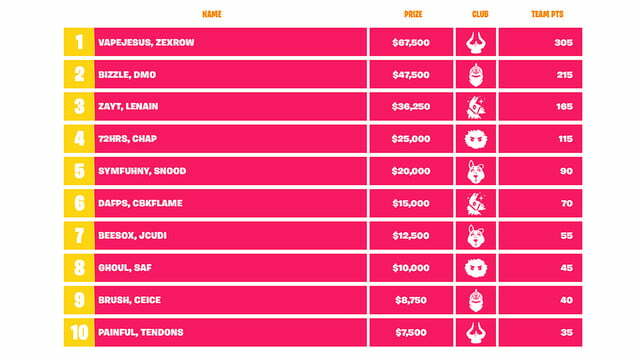 The prizes listed below are awarded to two groups of players that placed in the top 10 in Hold the Throne duos during week one of the Fortnite Fall Skirmish. The Hold The Throne winners completing the event with a total of 11 eliminations each are teams Kinstaar/Hunter and Chap/72hrs. You can find both group placements below and on the official Epic Games website. At the end of week one, the Club in the lead is Bush Bandits with 690 points. Dusty Dogs and Fort Knights follow closely behind with 540 and 420 points. Rift Raiders and Lucky Llamas take fourth and fifth place with 340 and 275 points. Squad Goals awards the four-person team with the most eliminations during a Fortnite Squad game. Individuals that have the most eliminations in a squad will be awarded points for their assigned Club. 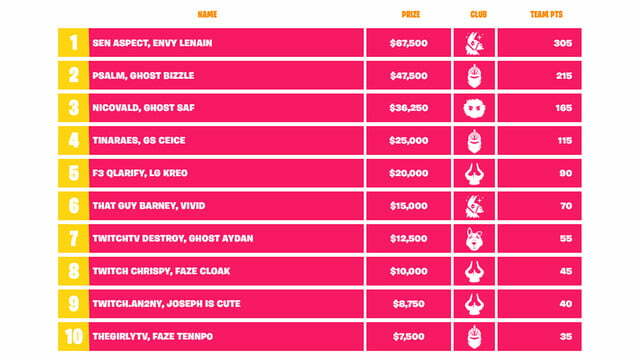 The prizes listed below are awarded to players that placed in the top 5 during week one in Squad Goals of the Fortnite Fall Skirmish. The top 5 Squad Goals teams that finished the event with the most eliminations are below. The week two format includes two Fornite games — a solo skirmish named Royale Flush and a trial called Spin and Win. Similar in style to week one’s Hold the Throne skirmish, the Royale Flush format awards the top 20 competitors with the largest sum of points at the end of six matches. This time though, players are in it for themselves, as this is a solo event. The person with the most eliminations in a match gets to walk away with $25,000. Any player who earns a Victory Royale and over seven eliminations get an additional +2 points and $10,000. 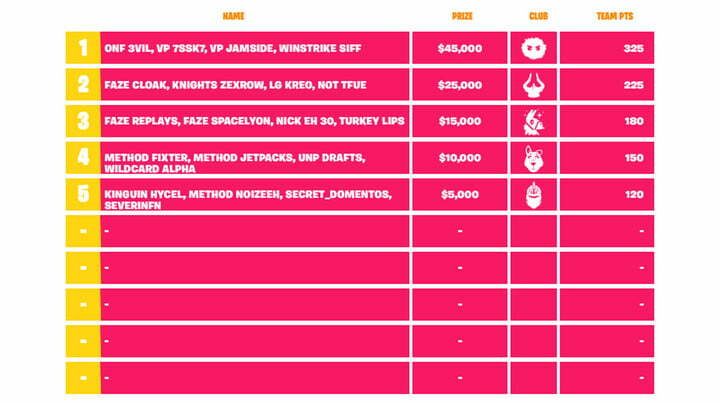 The prizes listed below are awarded to two groups of players that placed in the top 10 during week two in Royale Flush of the Fortnite Fall Skirmish. Royale Flush winners that finished the event with the top eliminations in a match are players Razzerooo/Tommo/Teekzie. At the end of week two, Bush Bandits leads the competition with 1,615 points. Fort Knights and Dusty Dogs are a close second and third with 1,090 and 1,025 points. Rift Raiders and Lucky Llamas follow behind with 1,020 and 780 points. During specific times of the week, a wheel is spun featuring a variety of challenges. Whatever challenges the wheel lands on are given as tasks for each Club to complete. Clubs that complete these challenges earn additional points and prizes. 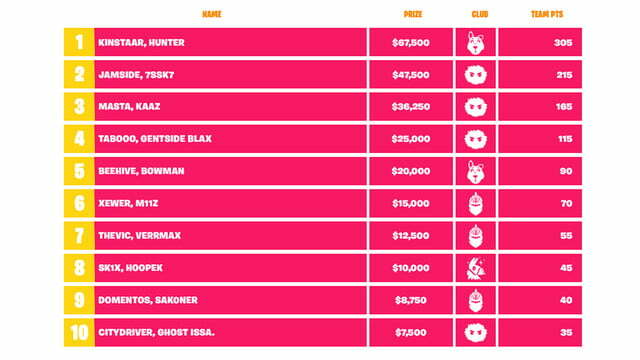 The prizes listed below are awarded to players that placed first in the Spin and Win challenges during week two of the Fortnite Fall Skirmish. 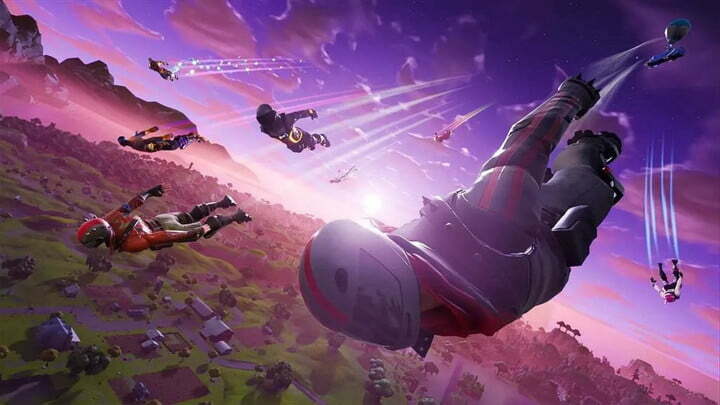 The week three format includes two Fortnite games — a skirmish called Duos King Pin and a trial named Lazy Links Tour. The goal of Duos Kingpin is to be the two-person team with the most points following six matches. 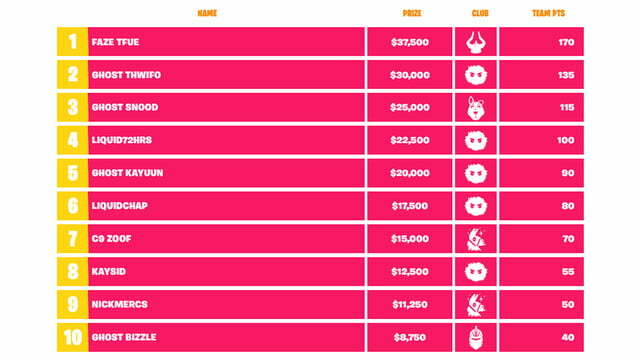 The final ranking is decided by Victory Royales and the total amount of eliminations a team earns by the event finale. The top 10 players will be awarded from a prize pool of $50,000. The teams that walk away with a Victory Royale or 8+ eliminations in a match will earn x2 points during the following match. 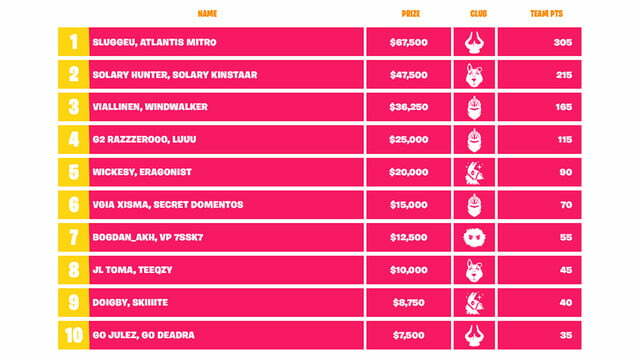 The prizes listed below are awarded to two groups of players that placed in the top 10 in Duos Kingpin during week three of the Fortnite Fall Skirmish. Duos Kingpin winners that finished the event with the top eliminations in a match are players Go Deadra/Go Jules and Faze Cloak/CLG Chrispy. Competitors from the various Fortnite Fall Skirmish clubs will participate in a Lazy Links golf challenge to earn points for their clubs. The players with the most points will get rewarded at the end of the tour. We will update this article with more information on the Fortnite Fall Skirmish as it comes.